In memory of Edith donations to Saint Mark’s United Church Cemetery would be appreciated. 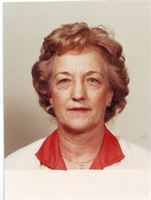 Edith Edna (Vye) Black, wife of the late Laurie Willard Black of Miramichi Senior Citizens Home, formerly of King George Highway, Miramichi, passed away Wednesday, April 10, 2019 at Miramichi Regional Hospital, at the age of 90. Born in Newcastle NB, she was the daughter of the late Thomas and Rena (MacKenzie) Vye. She was retired from the account department of Region 7 Hospital, a member of the former Saint Mark’s United Church, a member of Eastern Star Prince Charles Chapter and also a member of Ever Tru Rebecca Lodge. She is survived by two daughters, Donna Brown (Darrel) of Fredericton and Joan Black of Saint John, one son, Tom (Sandra) of Oak Point, seven grandchildren and two great grandchildren. Besides her parents and her husband, she was predeceased by one son Kenneth Black, three sisters, Hazel Vye, Sarah Matchett and Mary Noyes, two brothers, Perley and Robert Vye. Edith Edna (Vye) Black is resting at Davidson’s Funeral Home, 597 Old King George Highway, Miramichi, with visitation Friday evening, April 12, 2019, from 7-9 pm. The Funeral Service will be held Saturday, April 13, 2019, at 3 pm at Saint Andrew’s United Church, Wellington Street, with Reverend Charlene Maguire MacKnight officiating. Burial will be in Saint Mark’s United Church Cemetery at a later date.